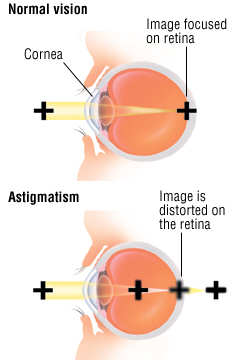 Astigmatism means that the cornea of the eye has an irregular shape, causing vision problems. The cornea is the clear covering over the lens and the iris. It protects these structures and helps to transmit light through the eye. The cornea is normally spherical, although in people with astigmatism, it may be shaped like a football or oval. This causes light to scatter instead of focus on a single point as it passes through the cornea, resulting in blurred vision. Many people have some degree of astigmatism. In fact, it is rare to find a perfectly formed eye. Astigmatism is thought to be hereditary, so if you have astigmatism, chances are good your children will have it also. The condition often occurs with other vision conditions such as nearsightedness (myopia). Many people confuse astigmatism with "lazy eye" (amblyopia). They are not the same condition though severe astigmatism can contribute to amblyopia.